The majority of the Sarasota County commissioners have agreed that a proposed amendment to the Siesta Key zoning regulations should be initiated privately, instead of having county staff undertake the work. A motion Commissioner Michael Moran made that called for staff to handle the changes died for lack of a second on Aug. 29. The action came in response to a staff memo following up on requests the board heard on July 12. Siesta Key architect Mark Smith — who also serves as chair of the Siesta Key Chamber of Commerce — and several business owners urged the commission that day to amend the Siesta Key Overlay District (SKOD) zoning regulations to clarify that a new building constructed in a Commercial General district would not have to have a minimum setback of 25 feet from the street if it were taller than 35 feet. Since late last year, Dr. Gary Kompothecras, a chiropractor known for his “1-800-Ask-Gary” advertising, has been working on an initiative to construct what his attorney has described as a boutique hotel on the island. “When that attorney, Charles Bailey III of the Williams Parker firm, asked earlier this year for an interpretation of the SKOD language regarding commercial construction setbacks, Thompson responded in writing that the island’s regulations are superseded by the general county regulations. Therefore, a building taller than 35 feet in a Commercial General district would have to be set back a distance equal to half its height, with 25 feet as the minimum. The maximum height for commercial structures on the county’s barrier islands is 85 feet, she pointed out, so 42.5 feet would be the maximum setback. Bailey appealed Thompson’s findings to the county’s Board of Zoning Appeals. On June 12, that board voted 3-2 to side with Thompson. Subsequently, Sarasota attorney Robert Lincoln filed a Petition for Writ of Certiorari in the 12th Judicial Circuit Court on behalf of Kompothecras’ limited liability company, Siesta Acquisitions, seeking to overturn the Board of Zoning Appeals decision. However, based on the July 12 County Commission discussion, Judge Frederick Mercurio agreed to a joint motion of the county and Siesta Acquisitions to put the litigation on hold, pending the outcome of the zoning amendment process. “I don’t have an intended outcome or suggestion,” DeMarsh replied. “I think the answer is for us to take leadership in this,” Moran said. Then he made the motion to direct staff to pursue the publicly initiated SKOD amendment, but it died for lack of a second. Commissioner Charles Hines said he concurred with staff that, until Kompothecras, Mark Smith and others broached the issue on July 12, he had not heard from anyone who desired to have the SKOD commercial setback requirements changed. “Let them bring [the proposed amendment] to us,” he added of representatives of Siesta Acquisitions. “Then we’ll hear the debate …” If they disagreed with the board’s decision, Hines added, they could go back to Judge Mercurio. DeMarsh said the case has been held in abeyance until after a conclusion has been reached at the County Commission level. On Aug. 29, Catherine Luckner, vice president of the Siesta Key Association (SKA), sent the board a letter, indicating support of the privately initiated zoning code amendment. 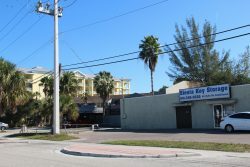 When news of Kompothecras’ hotel plans first broke in December 2016, Siesta resident Lourdes Ramirez was among the first to oppose them, citing concerns about increasing density and intensity of commercial uses on the barrier island. The SKOD already allows for tourist accommodations, she pointed out. Ramirez is a past president of the Sarasota County Council of Neighborhood Associations (CONA). When SNL notified her about the Aug. 29 County Commission discussion, she responded in an email, “I'm not thrilled with the idea of going through the text amendment process when I know Siesta's residents will overwhelmingly oppose the change to reduce setbacks on commercial buildings. It's a waste of our resources. But at least the county commissioners recognize that this request is to benefit just one entity and if this entity wants the shorter setbacks for his upcoming project then [he] should pay for the text amendment process.